Tinsel time is finally here, how are you gearing up for the holiday festivities? This little tyke is in the Christmas spirit how about you? Thanks, Free Bikes 4 Kidz for all the Holiday joy you have brought to the kids this year! As you continue to enjoy your winter weather fun, see all the places to explore, throughout the year, in the new national HaveFunBiking Guide. 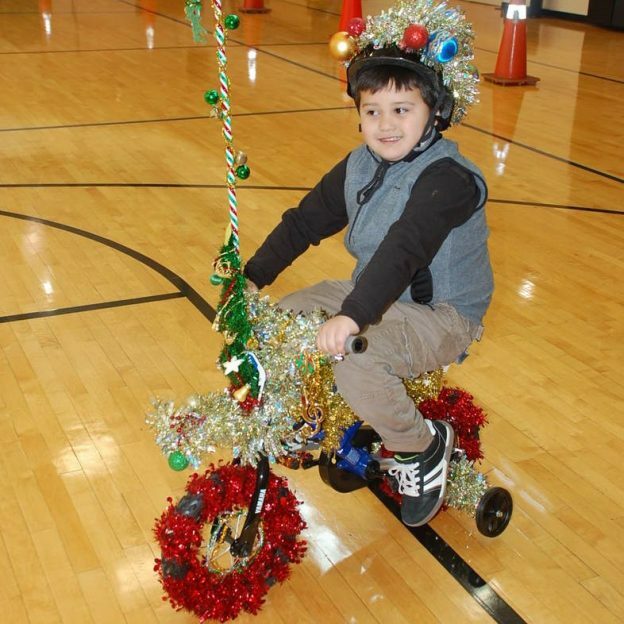 This entry was posted in Picture of the Day and tagged #FB4K's, #tinsel, #trike, #tyke, bike, bike decorations, Bike Florida, Bike Guide Minnesota, Bike Guide MN, bike Illinois, Bike Iowa, bike Michigan, bike minnesota, Bike Wisconsin, Christmas, decorated bike, Free Bike Map, free bike maps, free bikes 4 kidz, fun biking, Minnesota Bike Guide, MN Bike Guide, picture of the day, RAGBRAI on December 24, 2018 by Stephanie Hunt.